This is a plastic 1/72 Consolidated PBY-5A Catalina USN Patrol Airplane from Academy Plastics. It's for experienced modelers. The PBY-5A was the first version of this famous aircraft equipped with with landing gear, which made it a true amphibian plane. 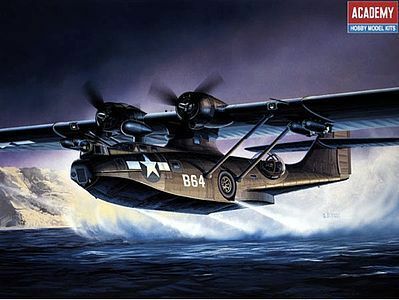 Painted black and armed with bombs and radar, the PBY-5A was used effectively against ships. Detailed 1/72nd scale for static display only..
Markings included for one aircraft..
112 parts in black and clear with delicate recessed panel lines.. Accurately reproduced engines and cowlings, optional front gu turrets.. Detailed waist gun positions with walkways and guns..
Cockpit detail: seats, bulkheads, instrument panel with decal bulkheads.. Detailed wing tip floats and retraction mechanism.. Bomb ordnance and radar antennae included..
Service History: USN patrol aircraft; served throughout WWII.. Description: Twin engine, high wing, flying boat.. Very nice kit from Academy. Being a 1/72 scale, it actually is quite big!! Went together very well and a fun kit to build!! Really don&apos;t have anything bad to say about this model. Would recommend it to a pretty good skilled modeler though if you want it to come out nice! Great price! Single sheet of decals which contains national insignia, instrument panel and code letters. Kit markings are for "Black Cat" B64 - no unit information given. Flat: Black, Aluminum, Metallic Grey, Yellow, Green, White, Interior Green.